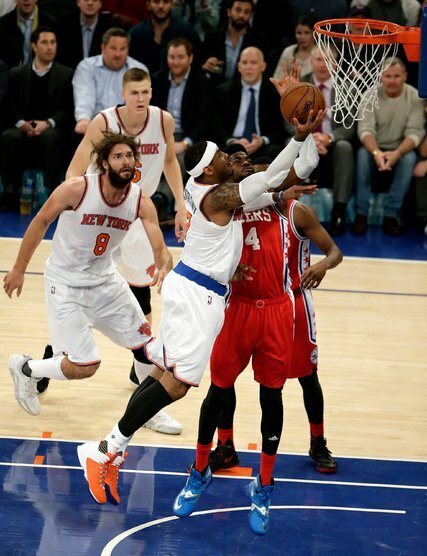 Carmelo Anthony, driving against the 76ers’ Nerlens Noel, had 12 points in his return from an illness. Philadelphia is 1-19 this season. Seconds before halftime, the crowd at Madison Square Garden seemed to be slipping into a comfortable slumber. The Knicks were playing well after four straight losses. It was of no small consequence that their opponents on Wednesday night happened to be the Philadelphia 76ers, who daydream of mediocrity. As has so often been the case this season, it was left to Kristaps Porzingis to wake everyone up. After cluttering the first half with rebounds and nifty bounce passes, Porzingis, the Knicks’ 7-foot-3 power forward, drifted to the perimeter for a rainbow 3-pointer that had fans chanting his name and had the 76ers reeling.